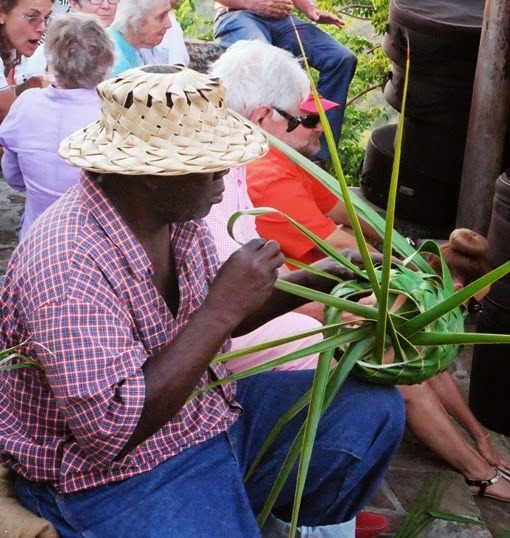 Galene goes West: Antigua - Birthdays, Repairs, and Cricket! 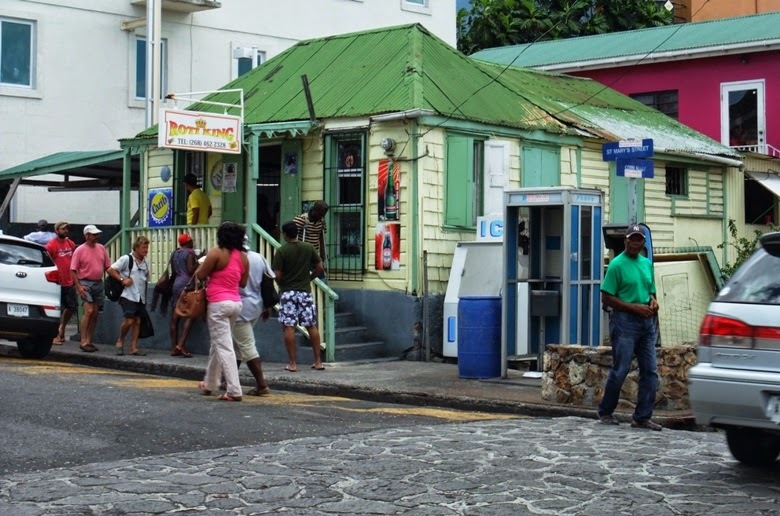 Antigua - Birthdays, Repairs, and Cricket! We are back in Antigua at last, home to Galene and her crew for the next couple of months. We have a lot to arrange and quite a full program. First are some running repairs to the fridge which is working intermittently. Purchase some new batteries as the existing ones are not holding their charge and then get our stern gland replaced so we are not leaking water into the engine bilge. 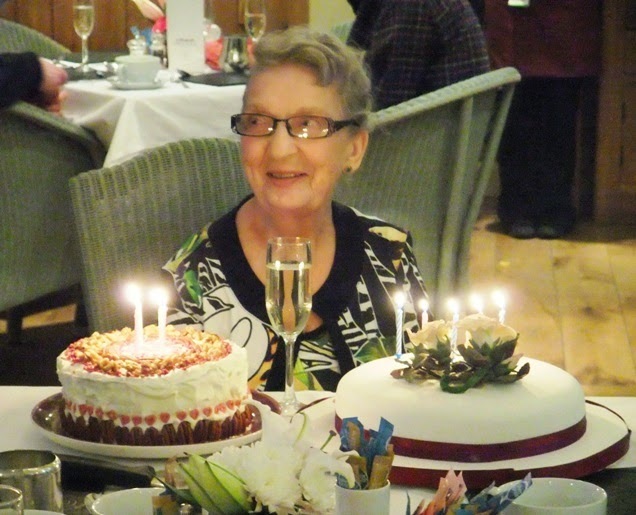 Rowena is flying back to the UK for her mother’s 90th birthday celebrations, then two of the ‘lads’ from Sutton Mariners are joining Richard for a 2 week cruise. The ‘lads’ fly home then Rowena is back then we have Ruth and Michael for two weeks over Easter and finally we are going to the cricket. 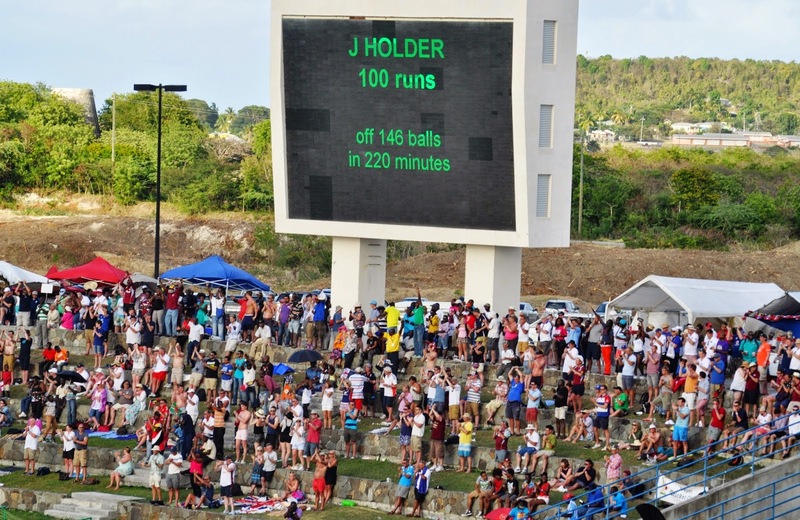 Yes, England v the West Indies five days of test cricket! We always seem to be doing repairs, while fixing the fridge and having the stern gland replaced the shore power battery charger packed up! Fortunately it is still under warranty and was purchased here in Antigua so we had no problem getting it replaced under warranty. Hopefully the new unit will last longer than the other one. It never rains but it pours, waking up one morning we find the engine bilge full of water! A black cloud of depression was hanging over us as we suspected the stern gland. Not so, the water was fresh, so we have a plumbing problem now as well! A long winded investigation eventually finds the source of the leak; the hot water tank is perforated. Not good news with guests arriving. Some old tried and tested remedies have managed to seal the worst of the holes but there are some that we cannot get at. The only solution is a new tank, which will have to be shipped in from St Maarten, and extensive plumbing modifications as the new tank will be fitted in a different orientation to the old one. Still we cannot worry about that now as the ‘lads’ have arrived and we are going sailing. 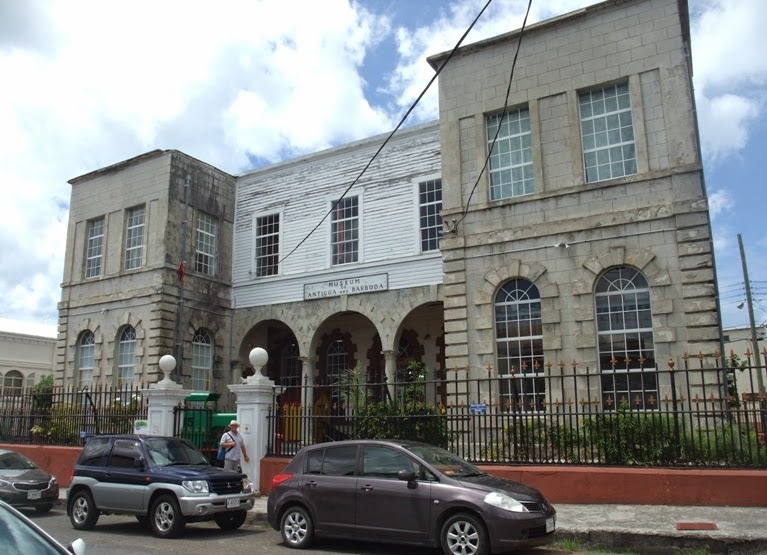 Antigua and Barbuda Museum - A potted history of the islands and worth a visit! Going sailing is the plan but the weather gods have other ideas. With forecast winds of 25-30Kts and rough seas, Paul and Vic will have to amuse themselves with a bus trip to English harbour, a day around the capital of St John and a little boat maintenance. Roti King a favorite lunch spot! The plans were to go to Montserrat, Guadeloupe and back to Antigua but we will have to settle for Deep bay, Great Bird and Maiden Island, back to Jolly Harbour to checkout and off to Guadeloupe for a long weekend. Look carefully - you can see the green flash! Intimate details of the ‘Lads’ cruise will remain secret (what happens on tour stays on tour!) Suffice to say the sailing to Guadeloupe and back was as exhilarating as ever! The snorkelling was sometimes good, sometimes not so good. Plenty of food and drink was consumed in Antigua and Guadeloupe, sunsets were watched, bodies got tanned, rum was sipped and storied were told! Well done lads, excellent company you are very welcome anytime. Just enough time to tidy up after the lads have gone home, replace the hot water tank and Rowena is back. A few days later our next set of visitors arrive, fortunately Ruth and Michael are staying in a villa in Jolly Harbour. The Skippers birthday doesn't pass unnoticed. A pleasant relaxing lunch at C&C's wine bar in St John tasting an amazing selection of South African wines! This the first time we have seen KWV cab sav in an age, we managed to resist the Johannisberger. Later being invited onto a South African boat, Paw Paw, Rowena and Elaine managed to empty a bottle in short order! Descretion being the better part of valor, the incident at the same time involving Richard, Roy and a bottle of French Rum will remain in it's own haze! Wildlife on the villa balcony! As ever Ruth and Michael’s holiday is fun filled. 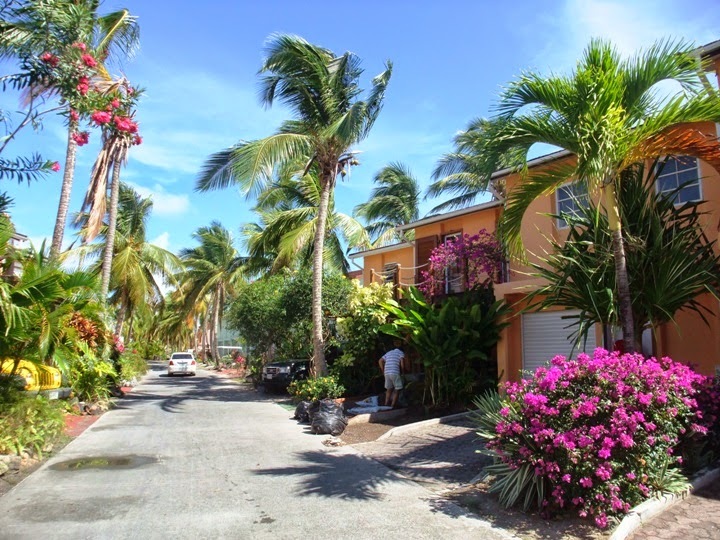 Meals ashore, walking and swimming off Jolly Beach, a bus trip to St John, BBQ suppers at their villa, Castaways on the beach for sundowners and Karaoke night. We think that evening the rum got to them as there were some sore heads the following day! 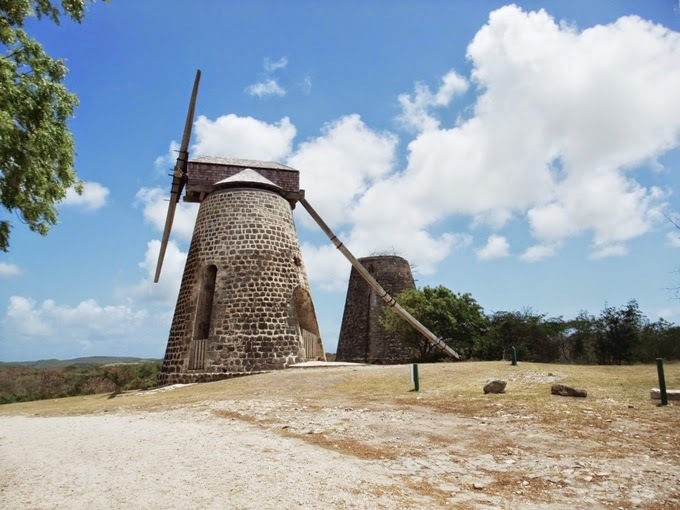 We hired a car for the weekend and toured the island; Pot works Dam, Betty’s Hope sugar plantation and rounded off with the Sunday BBQ at Shirley heights. A really good evening. A pan band playing upon arrival, little craft stalls and the magnificent view over English and Falmouth Harbours. The food was excellent too, with the jerk pork rivalling the jerk chicken from the roadside stall in Grenada. I am sure all the cruisers will know the one! 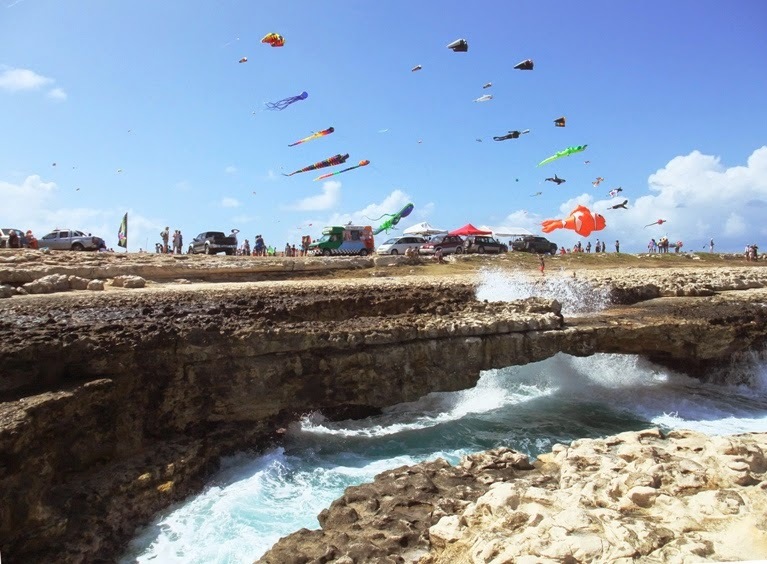 The following day we went to the Kite festival at Devils Bridge, took a picnic lunch in our cooler bag and hung out like a local! Great fun with some spectacular kites and lovely views out to sea. More beach and swimming, Ruth & Michael hired a Hobie cat for the morning and all too soon they were gone back home. A day to recover and regroup, then onto our next set of ‘guests’. Slightly different this time as we are looking after some customers of Vena Tour, a sports tour company, making sure their transport and hotel is OK, delivering their tickets for the cricket and generally making sure they have a good time. We hope Brian and Lloyd enjoyed themselves - we certainly had a good time! Shame England couldn’t have won – don’t get me started on that subject! 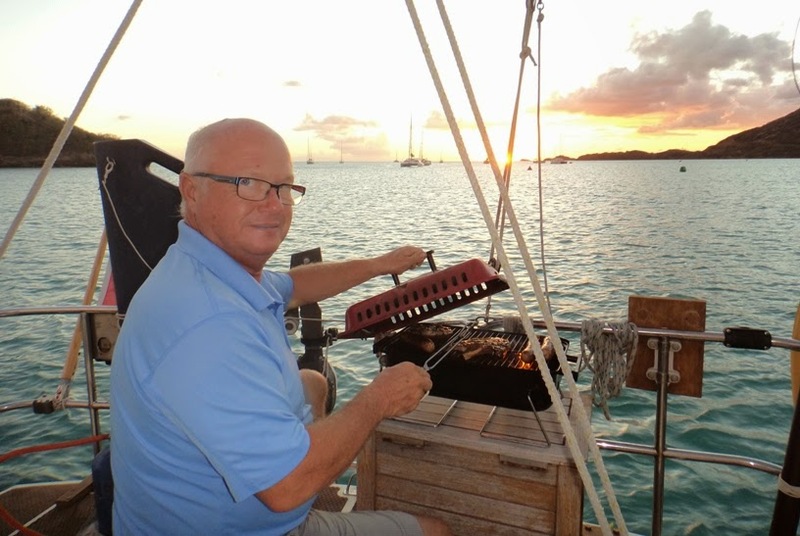 We are still in Antigua waiting for some post that cruising friends are bringing when they return from the UK mid-May. Jolly Harbour is a pleasant place in which to wait. Usually a very calm anchorage and we get to see the sunset every evening except when the sun disappears in a cloud. At the moment the setting sun is often a huge orange orb glowing through the Sahara dust as the Trades are blowing with gusto. We are meeting up with many friends which is really nice. Quite a few leave their boats here for the hurricane season, so there is a steady stream of boats coming in, we catch up for a few days, they are hauled and then they fly off. Others, like us, are here for a few repairs before heading off south and a few waiting for a good weather window to sail the Atlantic once again back to Europe. So an interesting mix of people. This results in excursions to Shells fish and chip bus, 2 for 1 pizza nights at Al Porto and several farewell sundowners on boats or at Westpoint’s Happy Hour. 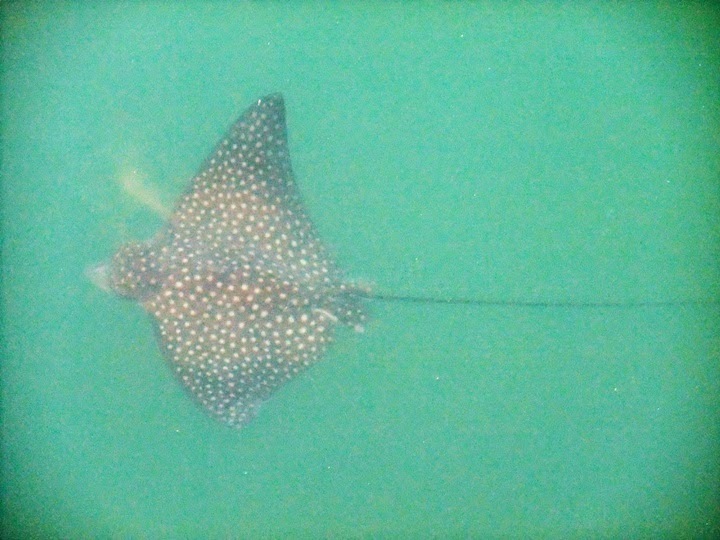 Spotted from the bar - Yes a spotted eagle ray! But only 30 cm, a baby. The only bad note is that the chikengunya is enjoying Jolly as well and showing a great reluctance to move on! Rowena is still lacking energy and suffering constant aches and pains, while Richard is doing much better with just the occasional ache and afternoon sleep. 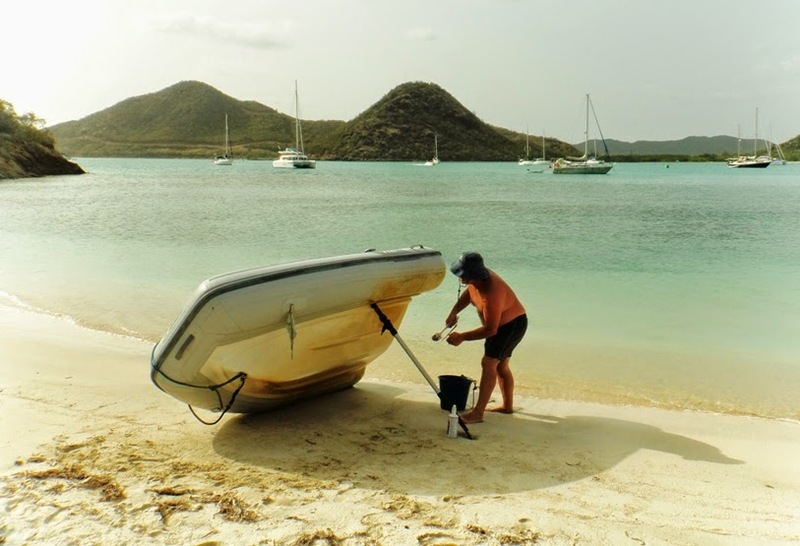 A skippers work is never done - Scrubbing the dinghy bottom - hardly an afternoon nap! 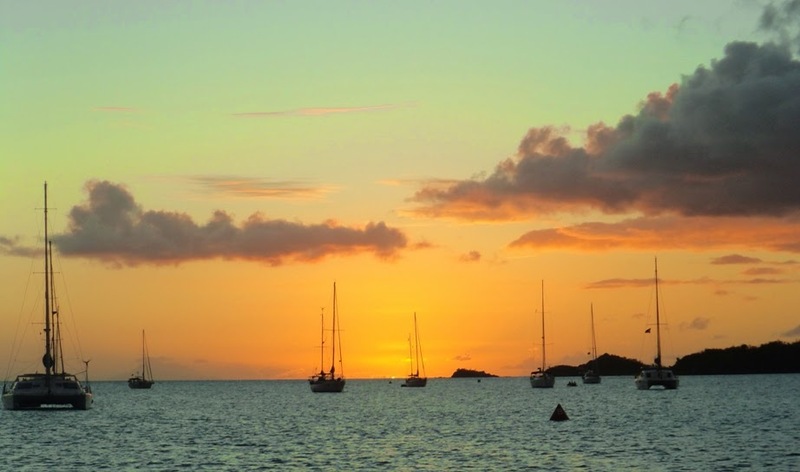 We will sail round Antigua a bit if Rowena’s hands get better and once we have our post and a good weather window we will head for Guadeloupe and south for the hurricane season.